Donegal Group Inc. is an insurance holding company whose insurance subsidiaries offer personal and commercial property and casualty lines of insurance in the Mid-Atlantic, Midwestern, New England and Southern regions of the U.S. The insurance subsidiaries of Donegal Group Inc. and Donegal Mutual Insurance Company conduct business together as the Donegal Insurance Group. 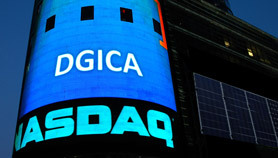 The Company’s Class A common stock and Class B common stock trade on NASDAQ under the symbols DGICA and DGICB, respectively. As an effective acquirer of small to medium-sized “main street” property and casualty insurers, Donegal Group has grown profitably since its inception in 1986. The Company continues to seek opportunities for growth while striving to achieve its longstanding goal of outperforming the property and casualty insurance industry in terms of service, profitability and growth in book value.